Hello Doknow.org fans. Today we want to present you a nice little DIY project. What is it about? Everyone has a pot or pots at home. 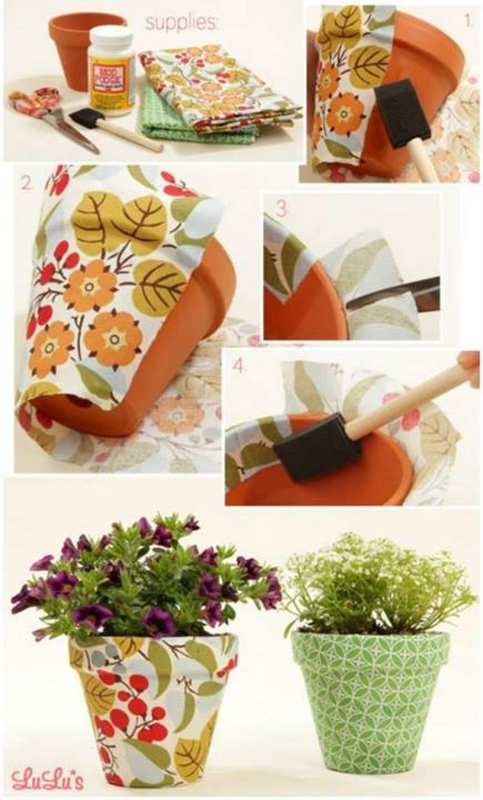 If you have spare piece of fabric, then you can create a nice "dress" for your old pots. What do you need? Not much - a pot, piece of fabric (the more colorful - the better), glue, brush for the glue and scissors. Where to start? - cut a piece of fabric, big enough for the whole pot. Then paint the pot with glue. Start wrapping the pot with the fabric, which will stick to the pot, thanks to the glue. At the top, you have to cut the fabric (see the pictures) in order to create good circle. Don't worry, the fabric will stick to the fabric, just add some more glue. Repeat the same for the bottom part. Plant your favorite flowers in it. The good thing is that the fabric is resistant to water, so the you can water your plants with no worries.